Have you ever wondered about a Poison Dart Frogs habitat, life cycle, and diet? The desert is a harmful place for a Poison Dart Frog to live. Poison Dart Frogs go through an incredible life cycle. Also they have a similar diet to a Bull Frog. As you can see, there are many fascinating topics about a Poison Dart Frog. I strongly belive it is harmful for a Poison Dart Frog to live in a desert. One reason is a Poison Dart Frog needs to stay somewhere with water so their skin can stay moisturized. For example in the desert there is a little bit of rainfall, but in a rainforest, there is a large amount of rainfall. Poison Dart Frogs need a lot of water so the slime on there back wont dry out. This slime is their poison. Another reason Poison Dart Frogs should not live in a desert is that they lay there eggs in water. Rainfall collects into a center of a plant called the bromeliad. Poison Dart Frogs lay there eggs inside of this space. 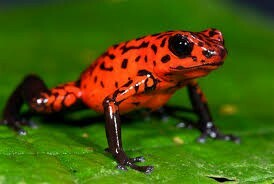 For all the reasons live given, I feel it would be dangeros for a poison dart frog to live in a desert. The diet of a Poison Dart Frog and the diet of a Bullfrog are both alike and different. A Poison Dart Frog uses its excellent vision and long sticky tongue to capture its prey. A Bullfrog also uses its tongue, but then uses its front legs to stuff food in its mouth. 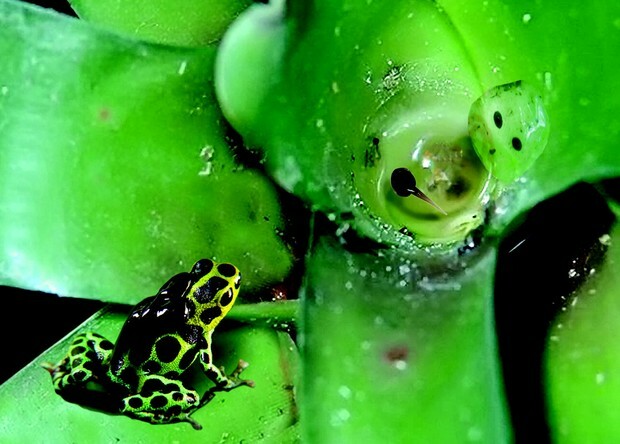 Both Poison Dart Frogs and Bullfrogs eat small bugs such as ants, spiders, and beetles. However, Bullfrogs also eat crustaceans, for example crayfish. As you can see, there are similarities and differences between the diet of a Poison Dart Frog and the diet of a Bullfrog. Did you know Poison Dart Frogs go through an in interesting life cycle? First, a male frog and female frog mate. The female lays eggs after they are done mating. When a tadpole is first born, its gills are not developed. It takes four weeks for the gills to become covered with a clear skin and develop. Tadpoles begin to grow front and lack legs. Eventually, they become a little frog. This looks like a big frog with a short tail. The frog eventually begins to lose its tail when it develops into an adult frog. As you can see, a frog develops through a life cycle.